Community & charity fundraising events using team building activities. Team building through community projects is becoming increasingly popular. Teams can have an enjoyable team building event and at the same time make a vital contribution to a local community or organisation. These programmes can be either a one day event, or an ongoing project which can be handed down from team to team in the future. Projects can be located in any UK or European location and are often linked to children or youth projects. Examples of programmes include decorating a house or hostel, clearing and replanting a park area and complete renovations of playgrounds. We will locate and organise a day to meet a specific challenge or cause. This challenge will have a direct benefit to an important cause and will create a lasting legacy. All suitable tools and equipment will be provided along with organised catering, logistical transport, support and insurance. Professional event and project management ensures constant communication is maintained throughout the project. This allows participants to meet desired outcomes through the charity team building challenge. Progressive Resources are pleased to have been given the opportunity to work closely with some excellent charities. Each charity works individually with respect to significant and important causes. 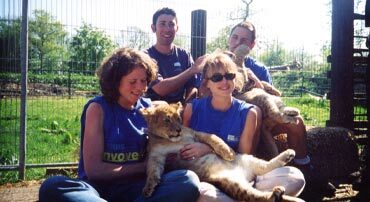 Our charities fundamentally work for childrens' projects, youth projects and animal conservation causes. Please click on the links below to see further information on our specific charities. Alternatively if you have a particular charity in mind, we can create a specific package for any cause within the UK. Organised Charity fundraising evenings, such as Casino and James Bond evenings are also available. All funds raised will go directly to a good cause within the UK. The Hospitality area of the Paradise Wildlife Park is now available for themed evenings. This comes with a fitted music system for any charity evening or any other evening entertainment.